China Admissions is please to share the information on AXA Tianping Medical Insurance to provide International Level Medical Insurance for Foreign Students in China. It is a legal requirement for all students in China to have medical insurance. If you do not have insurance at this time you will need to buy the local Chinese student insurance. – The costs needs to be paid by you direct and is reimbursed by the insurance company later. – There is a limit to the hospitals that can be used. 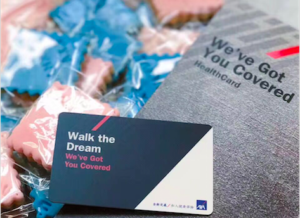 With feedback from students, we are pleased to announce we have partnered with AXA to provide more comprehensive medical insurance for foreign students in China. This should provide you with comprehensive medical service to be easy to use in case of a small problem. It can also help to cover in case of any emergency in China with a high level of medical treatment. AXA was founded in France in 1817 and is one of the largest insurance companies in the world. It has over 165,000 employees and over 100 Billion Euros in Revenue. – English departments of hospitals using AXA’s comprehensive network of hospitals in China (no need to bring a Chinese friend). – Direct Billing Card – you will receive a card which you can use to pay for your expenses in the hospital direct. No need to pay yourself and then claim the money back later. *Pay by yourself and get reinbursed by Pingan later. Make sure to keep enough cash to cover the costs. And keep a record of all medical records and all laboratory tests to get approval. For more information on the insurance please complete the form below.